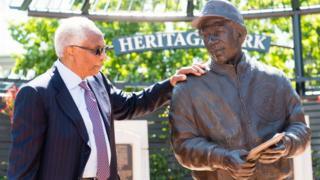 Legendary baseball Hall of Famer Frank Robinson - the first African-American to manage a Major League Baseball team - has died aged 83, officials say. After winning Most Valuable Player awards in both US leagues - the only player in history to do so - he went on to manage Cleveland in 1975. Born in Beaumont, Texas, in 1935, Robinson got his start in Major League Baseball in 1956 - just nine years after Jackie Robinson broke the colour barrier by joining a professional team.